When a business merges, there are good reasons. Efficiencies that can be found, money that can be saved, and a variety of other reasons, but those first two are a big part of it many times. for work… Can’t believe I’m actually posting this…. I’m finding that I need to do some consolidation in my home as well. Voila! A savings of 1 hour and 20 minutes! You non-math people are cringing right now, I know. Sorry. Here are a few examples of things in MY schedule that I’m attempting to merge or consolidate, or have successfully done in the past. I’m ever keeping an eye out for other things as well! When we first got home, this was absolute chaos. It’s settled out just a bit now… but it’s still overwhelming. Unfortunately, it is almost impossible to consolidate doctor appointments. Specialists are booked out months in advance, and have super limited timeslots that they see patients, and rarely do they every work in my schedule’s favor. In my attempt to reign in the madness, I took a long hard look at therapy appointments, the only place I had any say over. Right now we have 3 different therapies on a weekly basis on two different days. My goal is to change them to be all on the same day. Not only will this consolidate appointments to one day, but it will also save on gas and wear/tear on our aging vehicle, which is a HUGE thing for us these days. I average 3 trips a week to Nashville (a 45 minute drive) so this will take me down to one or two trips a week. I’m still working with all the therapists to find a solution, and my sister has offered us to “nap” at her house between appointments, so I’m praying this consolidation works and eases things a bit for both Annabelle and I! If worst comes to worst, we’ll switched to every-other-week therapy. My last resort, because I REALLY think she needs it weekly, but I hope to avoid that for now. A while back, I started preparing Annabelle’s formula a day in advance. It works super great, I make a pitcher full and just have to get out what I need at any given point without any additional mixing. But each day, I make a mess trying to measure out formula out of small containerss and then I have to clean what I measure it with and in general, it’s just another daily mess I make and have to clean up. So today, when I was contemplating the idea of “merging” and “consolidating” at home, I had a brilliant idea. What if I did the “measuring” of her formula powder on a weekly basis. One can of formula makes about a day and a half worth of food. So, today, when I measured out her formula, I took 2 emptied cans and a tupperware container, and I measured out 3 extra days worth of formula, put lids on them, and was done. So, from now until Thursday, when I have to prepare her food, I just pour in the water, pour in the pre-measured formula, stir, and I’m done. No hunting for measuring cups. No spilling power all over the counter as I try to make sure the amount is level. No cleaning up a mess. I figure on Thursday, by the time I refill the empty containers I have, I’ll have more empty containers, and can fix a weeks worth of formula. Heck, I might be REALLY crazy and get in the habit of measuring a months worth, once a month, when her formula is delivered. I would MUCH rather spend an hour once a month doing something than 15 minutes a day…. I do the same thing with a few other things, like cleaning her medicine syringes. 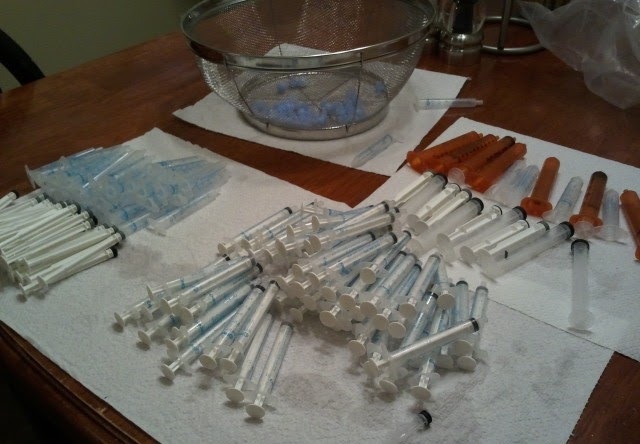 I have about a weeks worth of syringes. I rinse them out as I use them, but keep a bin of them and sterilize them once a week. Never mind mergers and consolidations… when it comes to laundry and cleaning, they are two places where I would LOVE LOVE LOVE to outsource. I’m learning that, for my sanity, that it’s best to stay on TOP of these things and do them little bits at a time. I get less overwhelmed that way. But… it’s easier said than done, and I’m still a work in progress on this part, as evidenced by my extremely messy house and my ultra embarrassment when anyone walks in and sees it…. Discussion: What are some areas where YOU can consolidate? And… do you hate doing laundry as much as I do??? Go ahead & outsource laundry. I taught my kids to wash clothes when they were 8 & 10, & they've been washing their own clothes since then. They've never ruined a piece of clothing, and they've learned to take wallets & mp3 players out of pockets. Seriously, if you have kids tall enough to reach the bottom of the washer while standing on a stool, start her 'wife' training. There's nothing that says that just because they have school, they shouldn't help at home. Teaching my kids to do their own laundry was the smartest thing I've ever done. We have 5 kids & do a ton every week. My 12 year old does his laundry on Monday & Thursday, & his bedding every other Saturday. My 9 year old does his on Tuesday & Friday, & bedding on the opposite Saturday from his brother. I do my 6 year olds, but he moves it to the dryer & then folds it & puts it away himself. This is great bc I dont have to try to figure out which socks belong to which kid – their wash is separate. They do clothes on cold & bedding on hot. That leaves me with laundry for me & my husband, which happens daily, our bedding (every Wednesday), my 6 year olds bedding (alternate Saturdays), towels (Monday & Thursday) & my 2 daughters, which I wash together & with their bedding bc I do it all in hot. They're only 3 months & 18 months, but my older one is always around to help put stuff in the dryer. i hate doing laundry but luckily me and my daughter have enough clothes for a week so i only have to do it once a week. i would probably do it more often but i live in an apartment so i don't. Your schedule would completely overwhelm me. You're my hero for making this all work!!!! You all are making me feel SO much better… I'm glad I'm not the only one who isn't a laundry/cleaning lover!! And you bring up a FANTASTIC point… although I would call it delegating vs outsourcing… HA HA! I think I need to reserve the art of delegating for a future blog post, ha! Ooh – speaking of laundry….it's not really consolidating, but it IS a big $ saver: have you thought about making your own laundry detergent? We make ours, it takes an hour every few months & saves us a ton. Google homemade laundry detergent. All you need is a bar of fels naphtha soap, borax, & arm & hammer WASHING soda. The recipe makes a 5 gallon bucket full of detergent. :). Also, I've never commented before today, but I love reading your blog. I don't know how you manage as well as you do!! And praise God for his protection of Annabelle. He is so good! I am so pleased I came across your blogspot. Praising God for you family and for the strength you have shown… Annabelle is indeed a special daughter with a special heart. Your journey has touched my heart deeply. I enjoyed my stop at your blog and I'm looking forward to reading more of your posts. Laundry is my least favorite thing to do. This summer, in order to make life easier in this area in the future, I plan on teaching my 6 year old and 5 year old how to do their own laundry. I already make them put their own clothes away once they are folded. Now it's time to teach them the rest! Another area I consolidate in is errand running. My daughter goes to preschool 3 days a week. I make sure to run all of my errands on those days when I am already on that side of town. This saves on gas and keeps me from running errands every day. These are some great ideas! Like Jenny, I stay on top of laundry by doing 1-2 loads a day. I throw it in every morning once everyone is up and then move it to the dryer (and start a second load if needed) at some point during the day, then fold it once everyone is asleep. Ours gets put away before I go to bed, and kids goes in a basket outside their room. I put theirs away in the morning as they're waking up and getting out of bed. Works pretty well for me – although, like Jenny, I really wish I could get them to put it away themselves! Hmmm…maybe it's time for Sierra to start putting her own away now that she's 5! Loving these organizational ideas! We could all use them! Great mom!!! One other thing we do during the summer…not so much during the school year except during breaks…three kids, one gets a week off…one has laundry duty mtw, second one has kitchen duty mtw, then they switch and one has kitchen tfs, and the other has laundry, tfs. Sunday is no chores, and they get one week off every three weeks. It's very nice during the summer. Since I work out of the house, it doesn't matter to me if they get up and do it first thing, or right before 5pm, they have the freedom to choose when, as long as it is done before I walk in the door.